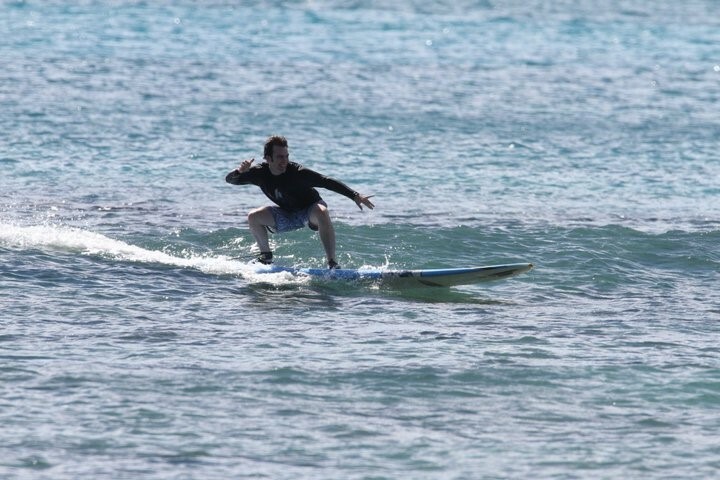 I learned how to surf on our honeymoon on the beach where surfing was invented. Kings of the Hawaiian royal families surfed for centuries at Waikiki Beach. Without knowing it, I learned something valuable. The actual surfing portion of being in the water only lasts for a matter of seconds, no more than a minute. The rest of the time you spend paddling out to the right spot in the water, waiting for the right wave and waiting your turn in the line of surfers. The paddling portion is rough after the first time or two. Your arms literally feel like they’re going to fall off. Finding the right wave is tough because you have to spend time reading the water and knowing the right moment to react. The waiting is tough too because the wave may look just right but its not quite your turn yet. Then, you hope when it is your turn you don’t fall off or miss the wave completely. Surfing is a metaphor for opportunity in life. You have to put in the hard work of paddling and knowing how to balance the board. You have to love it and practice it so much that you inherently know exactly when to react. Surfers don’t just jump on the board and take on a 40-foot wave. They spend years mastering their craft before they are even accepted by other surfers. Practice what you love. Do it repeatedly until you are the best. Then, ride your 40-foot wave.